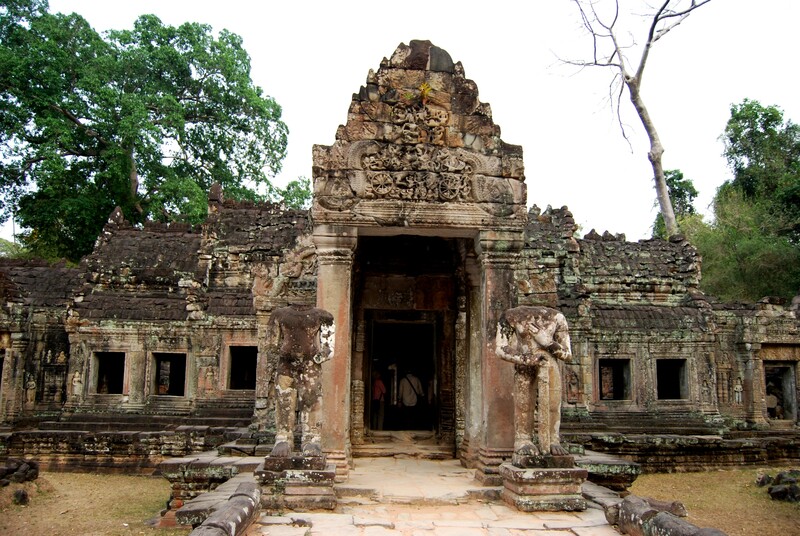 Nestled in the jungles of Angkor Wat lies Beng Melea a sprawling temple covering over one square kilometer. This temple is hidden away and not very touristy, giving it an adventurous, ‘lost temple’ feel. Luckily for us our “guide” or rather tuc-tuc driver knew where we could see the best temples even if they weren’t on the tour map. We really appreciated the services of our local guide, and by the end of the visit we were very happy to pay extra for being taken around the tortuous route. This involved squeezing through the thick forest, clambering through small spaces, over fallen rocks and even being guided along fallen roof tops. There are trees growing from the broken towers and crawling over the fallen walls and statues scattered around. 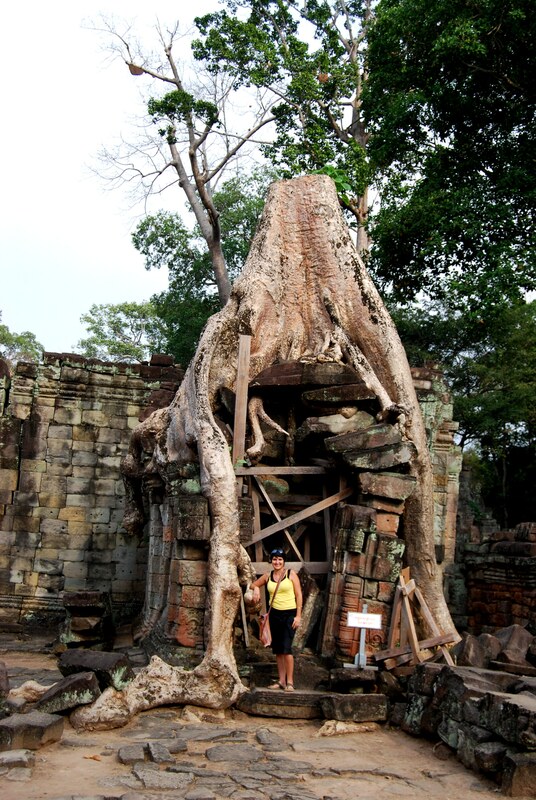 The galleries offer some of the best ‘tree in temple’ shots aside from Ta Prohm which was used in the Tomb Raider. 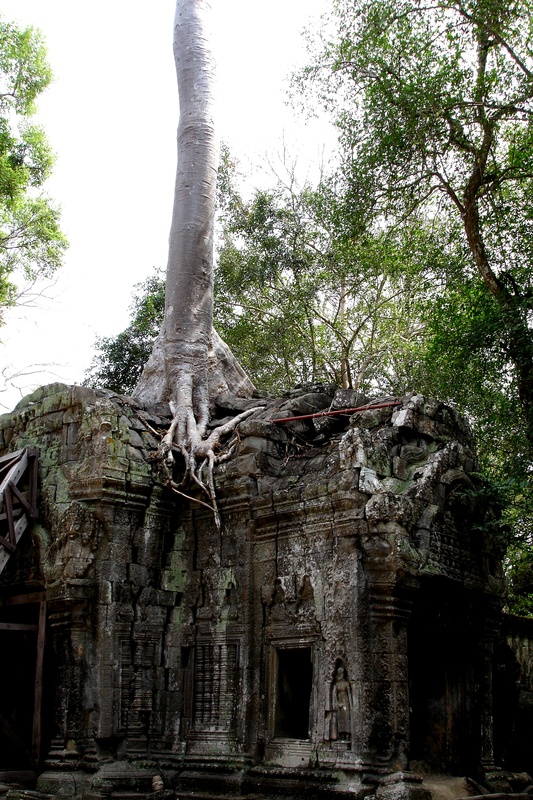 The most damage was done by the wear and tear of eight and a half centuries in a tropical climate, with the spread of vegetation, including the silk-cotton tree and strangler fig, going to work on some ambitious vaulting which was being tried out here and at Angkor Wat for the first time. Though there are some lintel and doorway carvings, there are no bas-reliefs and the carvings are comparatively sparse, probably the main reason this temple is not part of the usual tourist path. Beng Meleais largely unrestored and for years it was difficult to reach, but a road recently built to the temple complex of Koh Ker passes Beng Mealea and more visitors are coming to the out of way site. 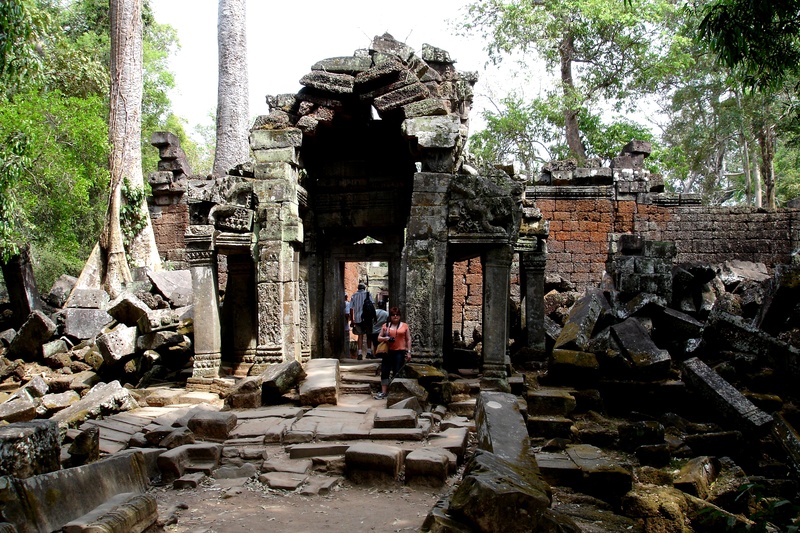 The history of the temple is unknown and it can be dated only by its architectural style which is identical to Angkor Wat, so scholars assumed it was built during the reign of king Suryavarman II in the early 12th century. Whoever built it must have been a figure of some importance, but he remains unknown, as no inscriptions have been found here, and no other that mentions it. You are living the life my friend…just amazing how this temple is still on its feet. I do love traveling and don’t think I will ever be able to stop exploring this amazing world we all live in! It is quite sad to think that the temples are being taken over by the jungle and someday there might be no sign of them left. Beautiful photos. We went there, too – and enjoyed the quiet! Fascinating! You’ve brought me to see a place that I may never see — and it looks as if subsequent won’t even get as good a glimpse as you did. Thanks for posting! Thanks Rusha!! We enjoyed exploring the temples but neither me nor my mom made it inside the ruins….we are both too scared of dark, tight spaces. I agree, and to think they are being left to fall further into ruins….someday there will be nothing left. 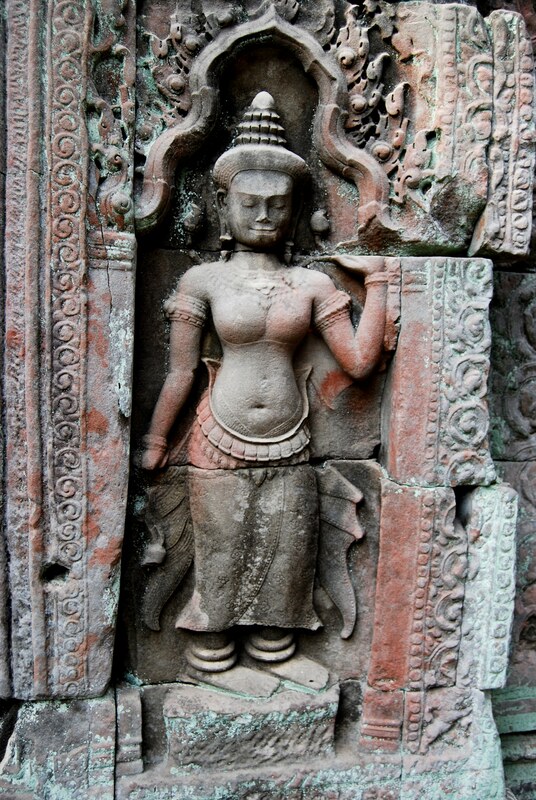 Angkor Wat is filled with so many amazing temples…..I do hope you get to explore this amazing place sometime. Beautiful, I get the Indiana Jones feel. Definitely!! It makes you feel like an explorer discovering a place for the first time. I think Beng Mealea is my favourite temple at Angkor.Such an amazing atmosphere. 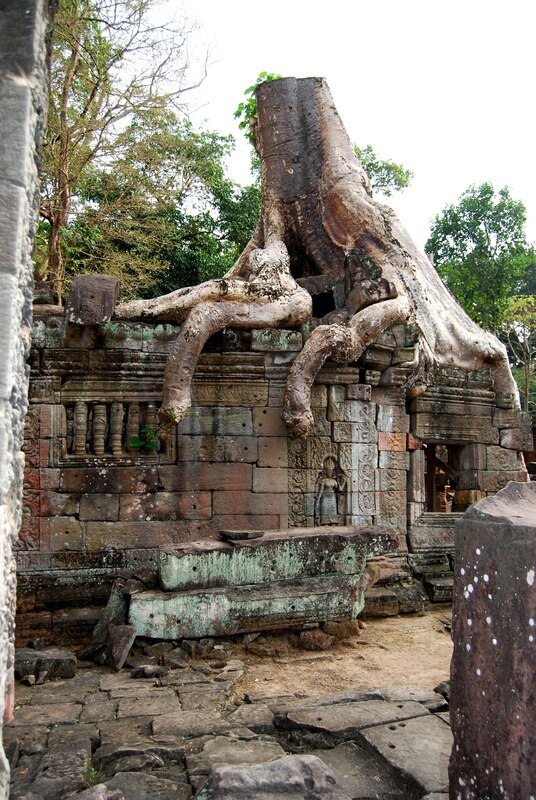 So interesting to see the trees reclaiming the land the temple was built on. Very beautiful yet quite sad at the same time, thinking this beautiful temple is busy disappearing back into the jungle. The tree roots are amazing! They are beautiful yet they are very destructive and busy destroying what is left of the temple. Angkor Wat is filled with so many unique temples to explore. I found it a miracle that anything in Angkor Wat is still standing as fragile as some of it is. It is astounding, and when you look at what is still standing you just wonder how amazing it had to look before it was left for ruins. It is such an interesting temple…definitely not even close to the norm that you usually find in cities.